Are you thinking about starting a family soon? Have you been trying to conceive for some time now? Yoga can increase your chances of ovulating, becoming pregnant, and bring an overall sense of peace to your conception journey. Infertility affects at least 12% of women of childbearing age in the U.S.. Of that 12%, 20% are considered ‘idiopathic’, meaning that doctors cannot figure out why these women cannot conceive. Stress could be a large part of the infertility equation. Women having trouble conceiving have been said to experience anxiety and depression similar to patients with AIDS, cancer and other serious illnesses, according to a study by Harvard Medical School. It can be a very maddening thing when your body is not doing what you wish it would. Feelings of resentment and anger towards your body and yourself are likely to arise at some point during your conception journey. When the body is stressed, the hormone cortisol is released, and the body begins to shut down less crucial functions such as the reproductive system. In fact, cortisol has been shown to interfere with ovulation, according to Eve Feinberg, a Reproductive Endocrinologist. Yoga has been proven to reduce stress and anxiety in people who suffer severely from both. The powerful connection of the mind and body, or the breath and movement, has been proven to be able to change gene expression. Yoga is not just about exercise. It is a sort of moving meditation. It has profound effects on the nervous system as well. When your body is stressed and cortisol is released, your ‘fight or flight’ response kicks into high gear. When this happens, your body believes that it is fighting for survival. It focuses all of its blood, energy and attention to things more crucial for survival. Things such as digestion and reproduction are placed on the back burner. The beautiful thing about yoga is that it allows you to engage your parasympathetic nervous system, which is the opposite from your ‘fight or flight’ response or the sympathetic nervous system. Your parasympathetic system, also known as the ‘rest and digest’ response, allows your body to function optimally and improve systems that have been ignored from an increase in stress. Quite literally, when you are doing yoga and reducing your stress levels, you are creating a better environment for a baby to grow and it becomes easier to conceive as a result. Yoga can improve fertility in ways unrelated to stress as well. Yoga allows you to let the river flow through you instead of trying to control the flow of the river. In other words, yoga will allow you to stop trying to control the conception process. It will also allow you to let go of feelings of frustration or resentment towards your body because with a yoga practice, you become much more in tune and connected to your body. A study conducted by Harvard Medical School did a yoga and meditation series for women struggling with infertility. When the trial was over, 55% of the patients conceived and successfully brought a beautiful baby into the world. Yoga can also increase blood flow to your pelvis, endocrine and reproductive systems, which improves their function. This increased circulation will stimulate hormone producing glands aiding in hormonal balance. Certain poses may help to clear adhesions and blockages in the reproductive areas. Yoga also tones and nourishes your reproductive organs by contracting and releasing them regularly during the practice helping to better prepare you for pregnancy and childbirth! 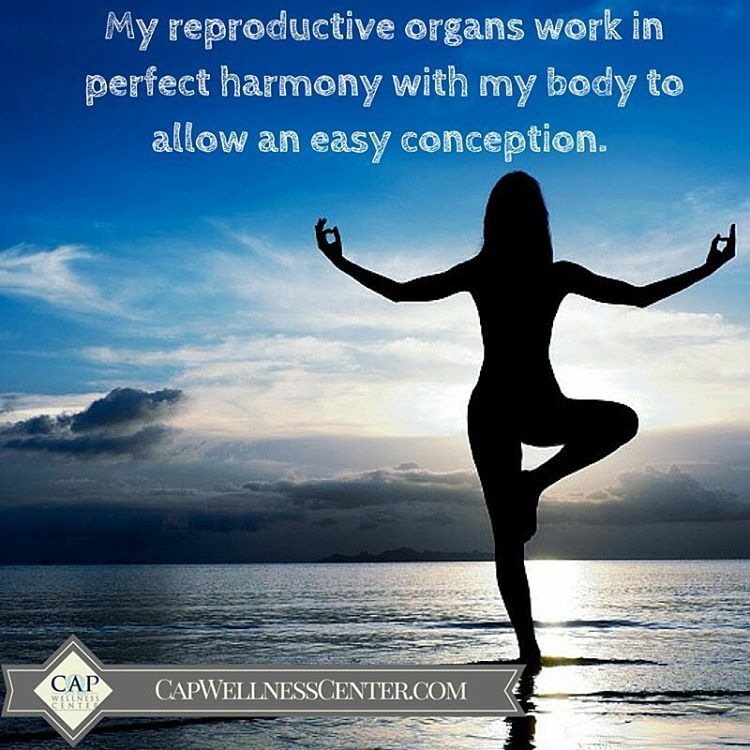 At CAP Wellness Center, we want to support you on your conception journey. Along with a regular yoga practice, other things that will improve fertility are a healthy lifestyle, a cleansing and healthy diet, along with acupuncture and massages. Our acupuncurist, Maring Higa, specializes in fertility treatments. Join our yoga classes and book a few treatments with Maring as a healthy and alternative therapy to improved fertility. Wishing you happiness in mind, body and soul.